* All Aluminum construction made from 6061 T-6 anodized aluminum. * CNC Machined from solid Billet for ultimate durability and precise fit. * 6 sided protection defends iPhone 4 & 4S against shocks, drops and movement. * Weighs 28 grams, less than an ounce. * Balanced feel and easy access to all buttons, sim card, headphone jack and charging slot. * Zero grounding precise fit; metal does not touch any part of the antennae. * Designed, manufactured and assembled in Orange County, California USA. 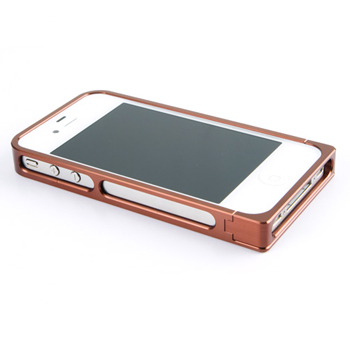 Proper design and fit are crucial when making an all aluminum cover for the famed iPhone 4 & iPhone 4S. Our Rokform designers and testing team spent months on every painstaking detail. Each cover is hand assembled and inspected to ensure a perfect fit then serial numbered as authentic one of a kind Rokform. Rokbed has been labratory and field tested for use with AT&T iPhone 4's only. Rokform cannot guarantee performance if using a Verizon iPhone 4. We have had reports of signal loss with customers using Verizon iPhone 4's and the Rokbed cover.